In geometry, the rhombic dodecahedron is a convex polyhedron with 12 congruent rhombic faces. It has 24 edges, and 14 vertices of two types. It is a Catalan solid, and the dual polyhedron of the cuboctahedron. The rhombic dodecahedron is a zonohedron. Its polyhedral dual is the cuboctahedron. The long diagonal of each face is exactly √2 times the length of the short diagonal, so that the acute angles on each face measure arccos(1/3), or approximately 70.53°. Being the dual of an Archimedean polyhedron, the rhombic dodecahedron is face-transitive, meaning the symmetry group of the solid acts transitively on the set of faces. In elementary terms, this means that for any two faces A and B there is a rotation or reflection of the solid that leaves it occupying the same region of space while moving face A to face B. The rhombic dodecahedron is one of the nine edge-transitive convex polyhedra, the others being the five Platonic solids, the cuboctahedron, the icosidodecahedron and the rhombic triacontahedron. The rhombic dodecahedron can be used to tessellate three-dimensional space. It can be stacked to fill a space much like hexagons fill a plane. This polyhedron in a space-filling tessellation can be seen as the Voronoi tessellation of the face-centered cubic lattice. It is the Brillouin zone of body centered cubic (bcc) crystals. Some minerals such as garnet form a rhombic dodecahedral crystal habit. Honey bees use the geometry of rhombic dodecahedra to form honeycombs from a tessellation of cells each of which is a hexagonal prism capped with half a rhombic dodecahedron. The rhombic dodecahedron also appears in the unit cells of diamond and diamondoids. In these cases, four vertices (alternate threefold ones) are absent, but the chemical bonds lie on the remaining edges. The graph of the rhombic dodecahedron is nonhamiltonian. A rhombic dodecahedron can be dissected with its center into 4 trigonal trapezohedra. These rhombohedra are the cells of a trigonal trapezohedral honeycomb. This is analogous to the dissection of a regular hexagon dissected into rhombi, and tiled in the plane as a rhombille. This animation shows the construction of a rhombic dodecahedron from a cube, by inverting the center-face-pyramids of a cube. 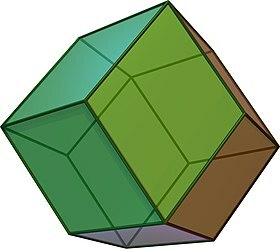 The rhombic dodecahedron has four special orthogonal projections along its axes of symmetry, centered on a face, an edge, and the two types of vertex, threefold and fourfold. The last two correspond to the B2 and A2 Coxeter planes. The rhombic dodecahedron can be seen as a degenerate limiting case of a pyritohedron, with permutation of coordinates (±1, ±1, ±1) and (0, 1 + h, 1 − h2) with parameter h = 1.
. With D3d symmetry, it can be seen as an elongated trigonal trapezohedron. The rhombic dodecahedron can tessellate space by translational copies of itself. So can the stellated rhombic dodecahedron. The rhombic dodecahedron can be constructed with 4 sets of parallel edges. Other symmetry constructions of the rhombic dodecahedron are also space-filling, and as parallelotopes they are similar to variations of space-filling truncated octahedra. For example, with 4 square faces, and 60-degree rhombic faces, and D4h dihedral symmetry, order 16. It be seen as a cuboctahedron with square pyramids augmented on the top and bottom. Bilinski dodecahedron width edges and front faces colored by their symmetry positions. Another topologically equivalent variation, sometimes called a deltoidal dodecahedron or trapezoidal dodecahedron, is isohedral with tetrahedral symmetry order 24, distorting rhombic faces into kites (deltoids). It has 8 vertices adjusted in or out in alternate sets of 4, with the limiting case a tetrahedral envelope. Variations can be parametrized by (a,b), where b is determined from a for planar faces. (1,1) is the rhombic solution. As (a) approaches 1/2, (b) approaches infinity. When projected onto a sphere (see right), it can be seen that the edges make up the edges of two tetrahedra arranged in their dual positions (the stella octangula). This trend continues on with the deltoidal icositetrahedron and deltoidal hexecontahedron for the dual pairings of the other regular polyhedra (alongside the triangular bipyramid if improper tilings are to be considered), giving this shape the alternative systematic name of deltoidal dodecahedron. This polyhedron is a part of a sequence of rhombic polyhedra and tilings with [n,3] Coxeter group symmetry. The cube can be seen as a rhombic hexahedron where the rhombi are squares. Similarly it relates to the infinite series of tilings with the face configurations V3.2n.3.2n, the first in the Euclidean plane, and the rest in the hyperbolic plane. Like many convex polyhedra, the rhombic dodecahedron can be stellated by extending the faces or edges until they meet to form a new polyhedron. Several such stellations have been described by Dorman Luke. This animation shows the construction of a stellated rhombic dodecahedron by inverting the center-face pyramids of a rhombic dodecahedron. Luke describes four more stellations: the second and third stellations (expanding outwards), one formed by removing the second from the third, and another by adding the original rhombic dodecahedron back to the previous one. The rhombic dodecahedron forms the hull of the vertex-first projection of a tesseract to three dimensions. There are exactly two ways of decomposing a rhombic dodecahedron into four congruent rhombohedra, giving eight possible rhombohedra as projections of the tesseracts 8 cubic cells. One set of projective vectors are: u=(1,1,-1,-1), v=(-1,1,-1,1), w=(1,-1,-1,1). The rhombic dodecahedron forms the maximal cross-section of a 24-cell, and also forms the hull of its vertex-first parallel projection into three dimensions. The rhombic dodecahedron can be decomposed into six congruent (but non-regular) square dipyramids meeting at a single vertex in the center; these form the images of six pairs of the 24-cell's octahedral cells. The remaining 12 octahedral cells project onto the faces of the rhombic dodecahedron. The non-regularity of these images are due to projective distortion; the facets of the 24-cell are regular octahedra in 4-space. This decomposition gives an interesting method for constructing the rhombic dodecahedron: cut a cube into six congruent square pyramids, and attach them to the faces of a second cube. The triangular faces of each pair of adjacent pyramids lie on the same plane, and so merge into rhombuses. The 24-cell may also be constructed in an analogous way using two tesseracts. ^ Branko Grünbaum (2010). "The Bilinski Dodecahedron and Assorted Parallelohedra, Zonohedra, Monohedra, Isozonohedra, and Otherhedra" (PDF). 32 (4): 5–15. Archived from the original (PDF) on 2015-04-02. ^ H.S.M Coxeter, "Regular polytopes", Dover publications, 1973. ^ Luke, D. (1957). "Stellations of the rhombic dodecahedron". The Mathematical Gazette. 337: 189–194. Eric W. Weisstein, Rhombic dodecahedron (Catalan solid) at MathWorld. Relating a Rhombic Triacontahedron and a Rhombic Dodecahedron, Rhombic Dodecahedron 5-Compound and Rhombic Dodecahedron 5-Compound by Sándor Kabai, The Wolfram Demonstrations Project.